Feeling like your home is out of control? Using a big picture perspective – and these 4 handy steps – will help you finally take control of your home! Isn’t it so easy to get trapped in the daily cycle of seeing a mess, feeling overwhelmed, and maintaining a semi-clean place through basic chores? That’s a totally manageable way to keep up with your home, especially if you’re busy. But … you may want more. You may wonder how to keep your home deep cleaned, as well. I dealt with the same struggle in my home – until I decided to strip everything away and start from scratch. By taking half a year to retrain myself, I was able to get my homemaking under control. Half a year sounds like a really long time when you want a quick fix. But in the big scope of things, when it means feeling long-term satisfaction, it’s well worth it. Besides – the time will go by, anyway. And you can choose to either spend the next half a year sticking to basic chores every day … or you can invest the half a year into getting everything on track. I can tell you, deciding to focus on regaining control in my home was way worth it for me. I think it will be worth it for you, too. 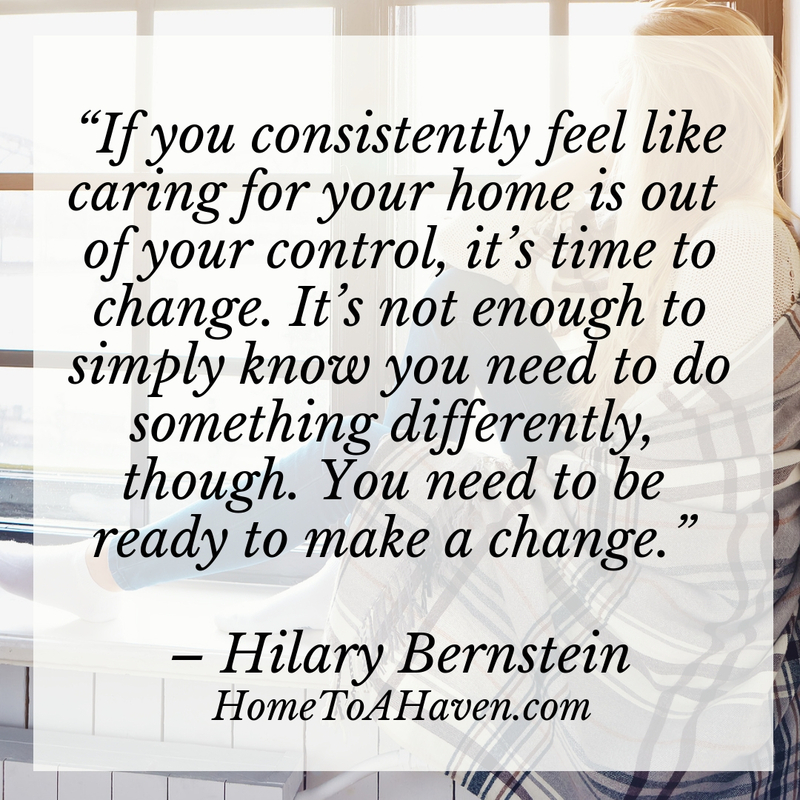 If you consistently feel like caring for your home is out of your control, it’s time to change. It’s not enough to simply know you need to do something differently, though. You need to be ready to make a change. And you need to be ready to commit to a little extra work each day. Choosing the right timing can set you up for success. If you know you’ll be gone quite a lot, it’s not a very good time to start retraining yourself how to care for your home. But if you know you can consistently set aside 15 minutes a day – most days – you can get started. The time of year you’re planning to work also makes a difference. Even if you’re naturally busier during the school year, choosing to focus on your home while the weather is less than desirable is fantastic. Case in point: I live in Ohio and unless you’re an outdoorsman, it’s best to stay inside for about six months out of the year. When it’s nice outside, it’s easier to want to spend time outside with my family. But once it gets cold and gray (and rainy or snowy), I’ve found I can make a huge change in my home just by spending less than 15 minutes a day doing a little extra work around my home. And that’s way better than spending those 15 minutes in front of the TV. Regardless of whether your entire home is out of control or you have just one messy room, it’s a good idea to pick a place to start. As you work on your space, you’ll start by decluttering this space – whether it’s a single drawer, an entire cupboard, or the whole room. Once you’ve decluttered that room, get rid of what doesn’t belong – either by relocating to the proper spot, donating, selling, or throwing away. After you’ve both decluttered and purged, it’s time to deep clean that space. Do all of the scrubbing you typically don’t do. Really, really clean that room. And once you’ve decluttered, purged, and deep cleaned that one room, celebrate! Enjoy what your room looks and feels like. Then move on to the next room in your home. Getting distracted by other rooms or projects in your home can be really tempting – especially if you ever feel like you have homemaking ADD. But stick to the one room you’re working on. Make sure you complete the decluttering, purging and deep cleaning process. Then move on to the next space. As you keep in mind that some rooms will be tougher to clean than others, you’ll keep a good perspective. 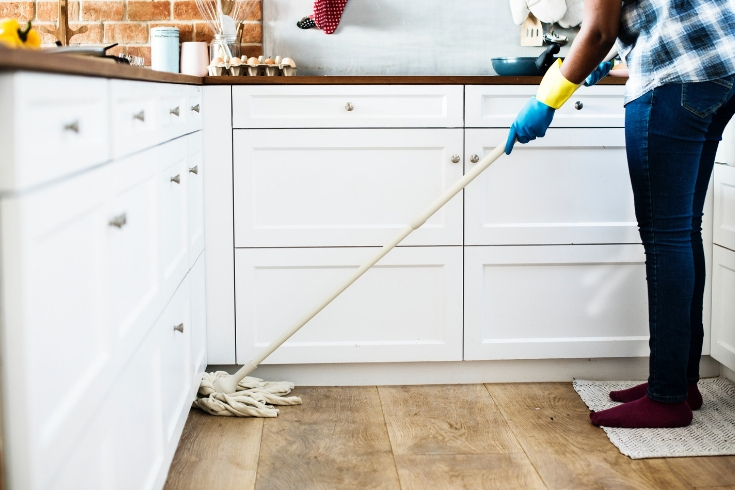 While you’re setting aside 15 minutes a day for this decluttering and deep cleaning, remember that this is extra cleaning for this particular season of life. It’s a project that will help you get everything under control. But it’s extra cleaning. Remember to keep doing your non-negotiable daily chores.keep doing your non-negotiable daily chores. Don’t let something like your dirty dishes get out of control just because you know you need to focus on deep cleaning the rest of your kitchen. 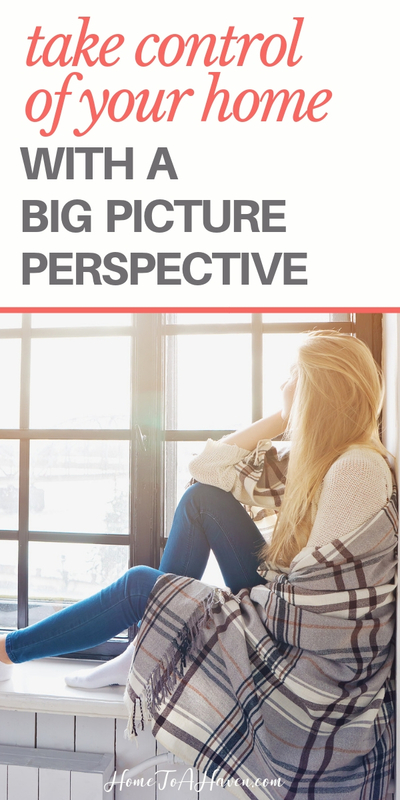 What’s the big picture perspective? You may only spend 15 minutes a day doing this decluttering, purging and deep cleaning cycle … but I promise that if you keep at it, all of your home will be clean. Really, really clean. Once that happens, realize that you have gotten everything under control. It doesn’t matter if it’s taken you one month or six months (or longer) to do this … that is no small feat. Don’t forget to celebrate your success. Personally, I’d throw a party … not for my home, but just to get together with friends and family, because you can show off all your clean spaces! Once you celebrate the fact that you have, in fact, gotten your home under control, it’s wise to try to keep it under control, if at all possible. It’s always easier to keep a clean house clean. Even if and when life gets busy again and your home reflects your busyness, remember to use your big picture perspective: with just 15 minutes of decluttering or deep cleaning a day, you can make a huge difference in your home. And that’s a fantastic step to creating a haven. Do you feel like your home has spiraled out of your control? 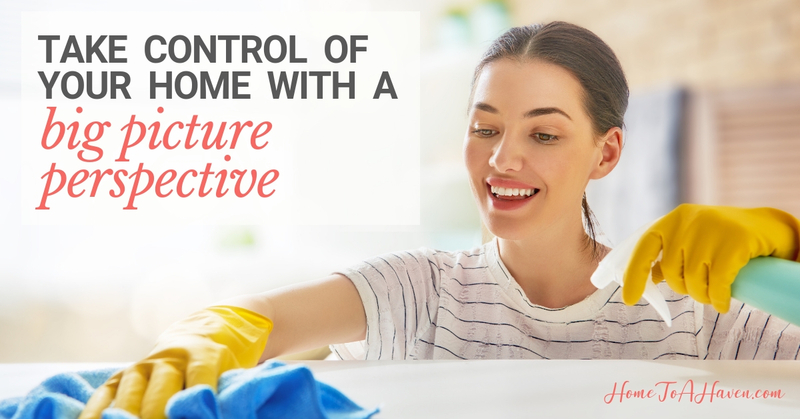 If you’re finding homemaking success, how have you managed to take control of your home? All images courtesy of Adobe Stock.